Wilfred Zaha is the latest to be added to Palace’s long list of absentees and will miss the trip to Goodison. Photo by Agencies. A lot will be at stake as the 195th North London Premier League unfolds at Wembley on Saturday. Aside from pride as the two teams are sworn enemies, each of them would want to bag three vital points in the race to the Champions league. The host Tottenham find themselves only a point behind Chelsea in fourth while Arsenal who are five away from the qualification spot risk falling further away should they loose. Spurs will be boosted by the fact that Toby Alderweireld, Harry Winks and Danny Rose all returned from long term injuries to play in the midweek FA Cup win over Newport County. With no injury concerns, Lucas Moura who was bought from PSG may be set for his home debut in Spurs colours. 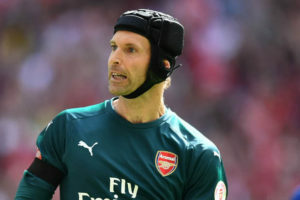 Arsenal have also been boosted by good news from their treatment room as both Nacho Monreal and Danny Welbeck are all fit but Petr Cech is a doubt with a calf injury sustained against Everton last weekend and Santi Carzola still has a while out. With a lot at stake, we expect a mouth watering clash on Saturday but Spurs being unbeaten in the last eight in all competitions and loosing only one of their last seven meetings with Arsenal will be confident they can get all three points. The last time the two side met at Wembly dates back to 1993 and 25 years later, Arsenal who won that day will surely try to avoid defeat as they are winless in their last 15 games away to the top five clubs. Everton where thrashed by Arsenal last weekend and a lot of changes especially at the back are expected. Leighton Baines, Maarten Stekelenburg and Ramiro Funes Mori remain unavailable but are nearing a first-team return after injuries. 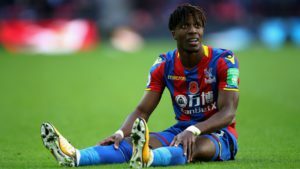 Wilfred Zaha, Julian Speroni and Martin Kelly are the latest players to be added to Crystal Palace’s lengthy injury list which includes Bakary Sakho, Scott Dann, Ruben Loftus-Cheek, Conor Wickham, Jeff Sschlupp and Jason Puncheon. January signings Alexander Sorloth and Erdal Rakip could both be involved. Jonathan Moss who was at the centre of the controversy will be in the middle for this one as many will look out for mistakes he may make but non of these side will be hoping that doesn’t happen to them because of their situation that may see them dragged in the relegation battle. Palace have won four of the eight Premier League matches at Goodison Park are only three points above relegation while Everton who have won four of their last six meetings with the Eagles are four points above their opponents. It may be too early but the result in this fixture may have adverse consiquences to the PL future of both clubs. Peter Cech is a major doubt for the North London derby this weekend. Photo by Agencies. Stoke forward Jese is in the squad for the first time since December 2, having been given time off to be with his prematurely-born son. Defender Bruno Martins Indi returns after missing the defeat by Bournemouth with a minor injury. Brighton’s £14m record signing Jurgen Locadia is set to make his debut for the club after overcoming a hamstring injury. Midfielders Steve Sidwell and Jiri Skalak remain their only absentees. The 2-2 draw in the reverse fixture last November ended Stoke’s eight-match winning run over Brighton in all competitions. Brighton are without a win at Stoke in 15 league matches since a 1-0 second tier victory in September 1961. This one is also battle for points that may save either side from relegation come May and Stock will feel they have the upper hand as they have not let in a goal against the Seagulls in any of their last four matches at home. Andre Ayew has overcome a hamstring injury and is in line to make his first Swansea appearance since rejoining the club last month. Loanee Andy King could make his debut, having been ineligible to face parent club Leicester last weekend. Burnley’s Stephen Ward is fit after a knee injury but fellow full-back Phil Bardsley will miss out because of a hamstring problem. Matthew Lowton will make his first start since recovering from injury. Swansea could equal their longest home winning streak against Burnley in the league – a run of four second-tier victories from 1931 to 1934. Burnley’s last away win at Swansea came in December 1995 at Vetch Field in the third tier, winning 4-2. Swansea seem to be rejuvinated under Carlos Carvalhal as they have earned seven points from losing positions in their six Premier League games under Carlos Carvalhal, beating Watford and Arsenal and drawing against Leicester but will be against a Burnely side who them selves are on the back of a 1-1 draw against leaders Man City having come from a goal down them selves. Its a battle between two sides either side of the table and who wants it most may prove to be vital. New West Ham recruit Patrice Evra may be involved despite having not played competitively since November. Marko Arnautovic has returned to training and could feature after three games out with a hamstring problem. Watford goalkeeper Heurelho Gomes remains out with a back complaint, while this fixture comes too soon for Miguel Britos. Younes Kaboul, Kiko Femenia, Will Hughes, Craig Cathcart and Nathaniel Chalobah also remain unavailable. 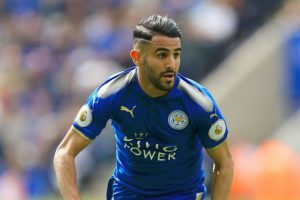 Riyad Mahrez has returned to training with his Leicester City side but is unlikely to feature against City. Photo by Agencies. West Ham have won just one of their last five home games against Watford. Watford could do the league double against West Ham for the first time after they won the first game 2-0. Watford find them selves three points above West Ham which highlights their recent slump down the table as they have won they have only earned one point and scored two goals in six away matches since beating Newcastle in November. West Ham are vying to go five successive league and cup games without defeat for the first time at the London Stadium. Manchester City vs Leicester City. Manchester City playmaker David Silva remains a doubt with the abdominal injury that caused him to miss last week’s draw at Burnley. John Stones might be available following a knee problem. Leicester’s Riyad Mahrez could miss a third straight match despite returning to the training ground on Friday for the first time since a failed move to the Citizens. Forward Shinji Okazaki faces a two-week absence with a knee injury. City have lost four of their six Premier League home matches against Leicester. Only Tottenham have won as many away games against them. However, Leicester’s only two victories in the last 14 competitive meetings came home and away in 2016. The Foxes could lose three consecutive league matches in this fixture for the first time since August 1961. The two sides have already met twice this season, with Manchester City winning 2-0 away in the Premier League and also advancing on penalties after a 1-1 draw in a Carabao Cup quarter-final in December. City lost two points on United last weekend when they drew 1-1 with Burnely and will hope Leicester do not become the fifth side they fail to beat in the league this season. The Foxes have taken just one point from their last four Premier League away games, having been unbeaten in the previous seven and find them selves 11 points of relegation.